Hello Everyone! Kaitlyn here! First of all, let me just say I’m really excited to be here and to be a part of this book loving community. I thought I’d start off by giving a little bit of information about myself and then sharing a few books I really enjoyed this year. Reading has always been a huge part of my life. I remember watching my parents read when I was little and I wanted to be just like them. I wanted to read books that transported me to new places, introduced me to different types of people and taught me about the world. As soon as I was able to read, I always had a book in my hand. It started with Hank the Cowdog and Goosebumps, then I moved on to Tolkien and Harry Potter, and then High School was all Stephen King. Nowadays, I’ll read just about anything. Last year was all nonfiction, and this year has been an eclectic mix of everything and I just want more, more, more. My love for reading has only grown over the years and I feel more passionate about it now, in this crazy technological age, than I ever have before. I hope to share some of my passion and enthusiasm here on this page. I should preface all of this by saying I very rarely read the synopsis of a book, so I had no idea what this one was about when I started it. I had never heard of the author before either so, like the ultimate cliché, I judged it entirely by its cover. Lucky for me, the cover is just as beautiful as the story that it holds. 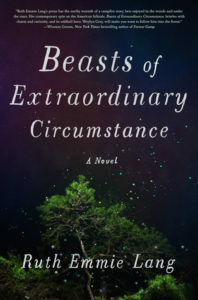 Beasts of Extraordinary Circumstance is the story of Weylyn Grey told by the people whose lives have been affected by their brief time with him. Each narrator tells their own experience with Weylyn, and they really are quite extraordinary. There’s the time he saved a girl from wolves, and the time he walked into the heart of a storm and it dissolved seemingly at his own will, oh and did I mention he lives in a house constructed of spider webs? It’s a story of magic, nature and wonder, and I just loved it. It’s a spectacular debut novel that makes me eager for whatever Ruth Emmie Lang writes next. I love a good memoir. 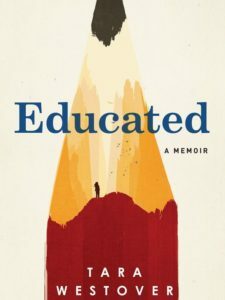 The Glass Castle and Wild are two of my favorite books of all time, so I’m always on the lookout for anything even remotely similar, which is why I was so excited when I first heard about Educated. Tara was raised by strict fundamentalist parents who didn’t believe in public school or any type of government interference, including any kind of medical care. They were essentially survivalists living deep in the mountains of Idaho. Her father owned a junkyard where he expected all of his children to work, and her mother was an herbalist and midwife. They were totally isolated and the only adults around to supervise the welfare of Tara and her siblings were her father and mother. This allowed for any number of abuses to be swept under the rug and neglect to go unnoticed. Tara was not allowed to go to school, so she had to teach herself and stepped into a classroom for the first time when she was 17. She then decided to attend college and is eventually accepted into Cambridge and Harvard. Tara’s story is often painful but it is also a powerful testament to self-determination, self-invention and the bonds of family. I know this may cause some controversy, but I am not above diving into a Young Adult novel every now and then. 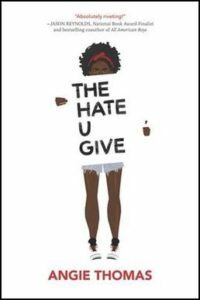 However, The Hate U Give is not just any YA and I really hope that the label doesn’t scare you away. THUG is another fabulous debut novel that centers around Starr. Starr lives in the poor part of town but goes to an elite prep school in an affluent neighborhood. When she’s at school she never lets anyone know where she’s from, and she hides any trace of the Starr she is when she’s at home. When the weekend comes around she decides to let loose and attends a party with her childhood best friend, Khalil. After the party is prematurely broken up, Starr and Khalil leave together. Shortly after, they are pulled over, and Khalil is subsequently shot and killed. Starr is the only witness and carries the burden of this truth with her throughout the story. Should she speak up and potentially risk her and her family’s lives, or should she keep quiet and continue to let the media slander her friend? It’s a timely story about race, police brutality, and the power of media. Angie Thomas does an incredible job addressing these important issues without being too political, but still hitting hard when she needs too. THUG is also slated to be released in theaters really soon, so read it before you see it! So, there you have it! These are just a few of the books I’ve loved this year and I really hope you check them out too! Books have the power to change us. Books inspire and motivate us, they teach us about different cultures, backgrounds, and history, they have the ability to transport us anywhere we could ever imagine, but only if we pick them up and read them. Keep reading folks.